In the Samgine original word game called Word Works the goal is to convert the first word into the second word by adding, deleting or changing only one letter at a time. Word Works is a great game and a must for Scrabble fans, crossword addicts and all lovers of word puzzles and games. But here is the thing, what if you get stuck? With crosswords there is always the trusty old dictionary. There are aids for Scrabble and other word games too. Well, for Word Works, we have provided a tool to help you out when you get stuck. 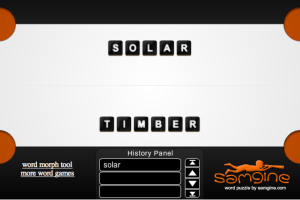 Just click on the link in the bottom left corner of the game called “word morph tool”. This will take you to a new page where you can use the word morph tool. This word tool transforms a word instantly as you type, giving you all the possible words when removing, changing or adding one letter from the original word. ‘Note’ could become ‘not’ if you remove a letter. ‘Not’ could become ‘got’ if you change a letter. ‘Got’ could become ‘goat’ if you add a letter. Now you know there is help on hand go ahead and play Word Works yourself.